MANILA, Philippines — About 725,000 people fled their homes and communities braced for coastal floods of up to 13 feet as Typhoon Melor slammed into the eastern Philippines on Monday, officials said. The government's weather bureau said the typhoon was packing winds of 95 miles per hour with gusts of up to 115 mph, and heavy to intense rain within its 185-mile diameter. Initial reports from Red Cross chapters in areas affected by the typhoon indicated "minimal impact so far," but some buildings were damaged, according to International Federation of the Red Cross and Red Crescent Societies spokeswoman Kate Marshall. The National Disaster Risk Reduction and Management Council said 724,839 residents of three eastern provinces were evacuated Sunday and early Monday before the storm's arrival. 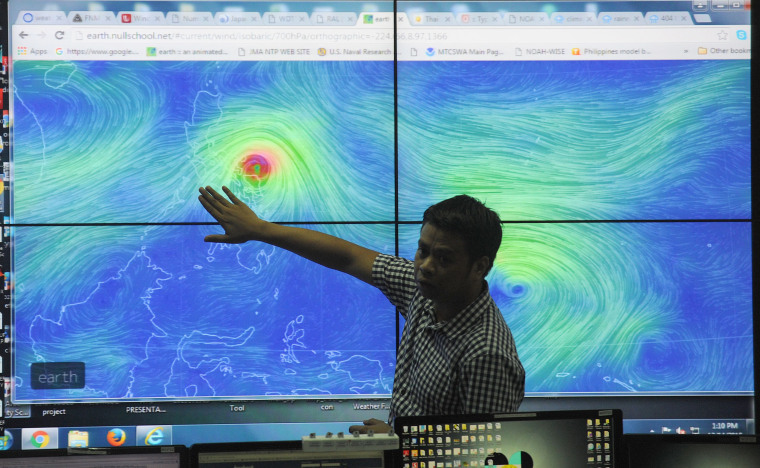 An average of six to seven tropical cyclones hit the Philippines each year, according to The Weather Channel. In November 2013, Typhoon Haiyan, the strongest typhoon on record to make landfall, left more than 7,300 people dead and missing as it leveled entire villages and swept walls of seawater into parts of the central Philippines. Correction: An earlier version of this story incorrectly stated how many storms on average strike the Philippines each year.